Note: This interview originally appeared on the Hamptons International Film Festival website. Much as The Discoverers is a road movie, Justin Schwarz's feature debut has taken a circuitous route to the big screen. Back in 2010, the writer/director was selected for the Hamptons International Film Festival Screenwriters' Lab, where he honed his screenplay about a dysfunctional family who find themselves on a journey of, yes, discovery. The film then premiered at HIFF in 2012, and is finally making its way to theaters starting this weekend. 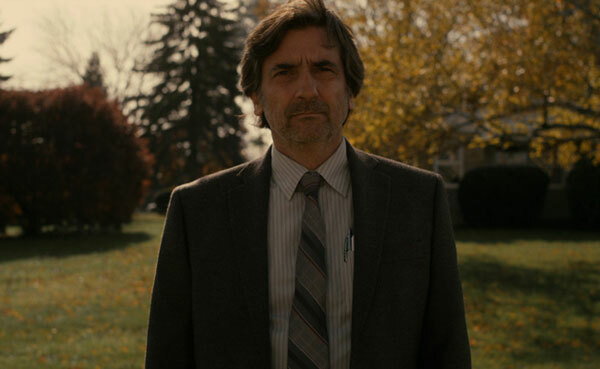 Griffin Dunne (After Hours) stars as Lewis Birch, an academic purveyor of not-quite-popular history whose principled refusal to cater to the lowest common denominator has left him without a publisher. Still reeling from his divorce, he doesn't quite know how to relate to his teenaged kids, portrayed by Madeleine Martin ("Californication") and Devon Graye ("Dexter"). When the trio's planned road trip from Chicago to Oregon--a quest to see the ocean combined with an academic conference for Lewis--is derailed, they detour instead to the Birch family home in Idaho. And that's where the fun begins. Mired in grief and shock, Lewis's father Stanley (Stuart Margolin) has suddenly disappeared, but Lewis has a sneaking suspicion where he's gone. They find Stanley in the woods, on a historical re-enactment trek following in the footsteps of the Lewis and Clark Expedition (!). Stripped of their modern technology--and in period costume--Lewis, Zoe and Jack reluctantly settle in for a few days of living off the land, bonding with the family, and taking their own respective journeys of self-discovery. Led by Dunne in a performance that's been lauded at various film festivals, the entire ensemble cast is just terrific. Their oddball characters have exactly the right amount of goofiness, and the sharply funny script leads them into unexpected territory. We caught up with Dunne and Schwarz in New York City on the eve of the film's theatrical release, where they talked about casting choices, on-set camaraderie, and Dunne's rightful return to leading-man status. The Discoverers opens May 16 in New York and May 30 in Los Angeles, with more cities to follow. Find tickets. Follow The Discoverers on Facebook and Twitter.